The brown-eyed Susan has alternate lanceolate or ovate leaves, reddish hairy stems and characteristic tri-lobed leaves near the bottom of the plant. Each upper stem has one or two flower heads which bloom from middle to late summer. The flower rays are bright yellow and oblong. A number of pollinators use the plant, including solitary bees, carpenter bees, halictid bees, wasps, beeflies, butterflies and the goldenrod soldier beetle. The brown-eyed Susan has tri-lobed leaves near the bottom of the plant. 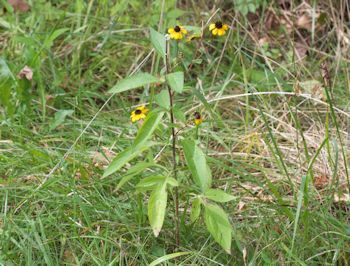 Photo by Ed EderRudbeckia triloba is an annual or biennial species. It is uncertain how it arrived in Dyke Marsh. Habitats where it has been found include areas with a history of disturbance, such as roadsides, railroad edges, vacant lots and abandoned fields. The existing population is small and close to the marsh. Observers have only seen two plants, “so, being a short-lived species, their persistence seems questionable in Dyke Marsh,” commented Brent Steury GWMP’s Natural Resources Program Manager. To see the plant’s range in Virginia, visit VirginiaPlantAtlas.org. Thank you, Ed Eder, for your keen observations.